Black Friday, one of the largest retail shopping days of the year, is just a week away. Customers will soon be waiting in line for hours for the best deals they can find. And you can bet they’ll be tweeting, Facebooking and Instagramming their frozen butts off. Already in 2014, stores such as Macy’s, Best Buy and Walmart have already announced plans to open their doors on Thanksgiving Day and the Prosper Spending Score pegs holiday spending as rising 8% in 2014. Social media traffic is a huge part of Black Friday for both brick and mortar stores and e-commerce alike. 84% of shoppers use digital tools before and during trips to a store. And those shoppers convert at a 40% higher rate than those who don’t use web-connected devices. Perhaps even more staggering is that 101.7 million consumers in the U.S. will make purchases via their mobile devices this holiday season, an increase of 37.3% from last year per Yahoo Advertising. If your business is a retail store or if your business is an eCommerce site, you can use social to drive awareness about a potential sale in this frenzied time of year and Twitter ads could be the best way for your brand to do it. 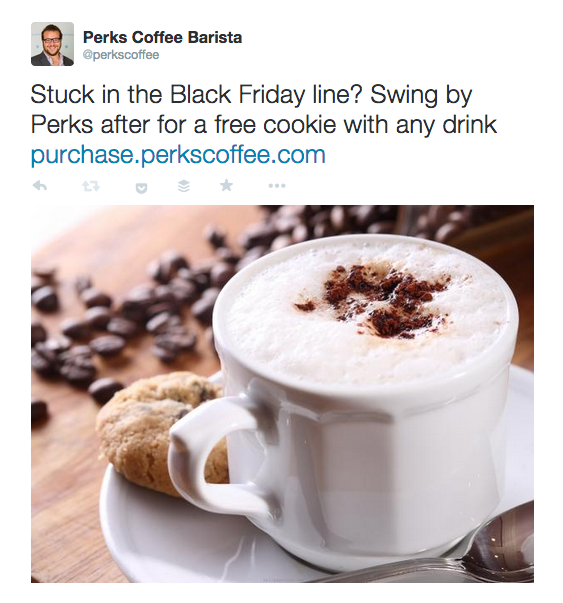 The advanced capabilities of Twitter’s self-serve ad platform allow marketers to create limited-window ad campaigns that target users during these crucial Black Friday hours. You don’t have to spend a lot to make a big impact, it’s really more about having four key pieces of information: keywords, location, competitors/lookalike brands and time. Where should people find your message? Hashtags and keywords are destinations, and knowing what people are talking about, or the way they’re searching for information gives you the ability to serve up your brand’s message in the place where it is most relevant. You may or may not want to sponsor ads for the term #BlackFriday depending on your budget and the scale of your business. But that is definitely not your only option. Here’s where it gets interesting — think about what people in your area might be tweeting about. Identify the terms that people in your geographic region (or your customer’s geographic region) are talking about the most in the days leading up to Black Friday that both directly relate to your business, but also to their geographic promixity to where your transaction might take place. You’re looking for things that will lock them into a particular audience, so a local landmark or store, for example I grew up in Syracuse where we have DestinyUSA as our main mall. Tools like Sprout Social can help identify hashtags your brand is commonly mention in and around, this helps to build out additional keyword lists. Many social networks like Instagram, Foursquare, and Yelp include location data simply by means of sharing the name of a place or city where you’re checked in or sharing a photo from. Don’t discredit that either. If you’re a small coffee shop in Syracuse like we mentioned before there’s no need to target your ads to the entire USA, instead target by city or even zip code. If you are a large chain of stores, like Macy’s, you can also target ads locally and regionally to each store location. And if you are an ecommerce platform, look for geographic trends in your existing customer base and past #BlackFriday customers. You might also want to take a close look at whether your product pages are selling for your mobile website vistors or just desktop. These device targeting options can be split depending on the product you are pushing, the sale type, and your mobile site’s usability. Think about how you can make your ad MORE relevant with location and device. Who do people in your region follow most? These can (and often should) be your competitors or other brands not in your space. For example, in addition to my competitor brands, I also like to target ads around regional colleges, local news stations, and the Twitter accounts of their anchors. While this is narrowing the overall audience size, I’m attempting to focus in on a specific type of person. Someone who follows college sports and news stations generally checks Twitter regularly, so that could be the type of person who is mobile and on the go. When do you want to run your ads? You might consider running them only during the morning, or only overnight when people might be standing in line. Think about it, people can line up on Thanksgiving! They’ll be sitting and waiting overnight, completely stationary and doing nothing but consuming content. Serve them up a great deal or message, start engaging and they might be headed to your place after all those big screens sell out. 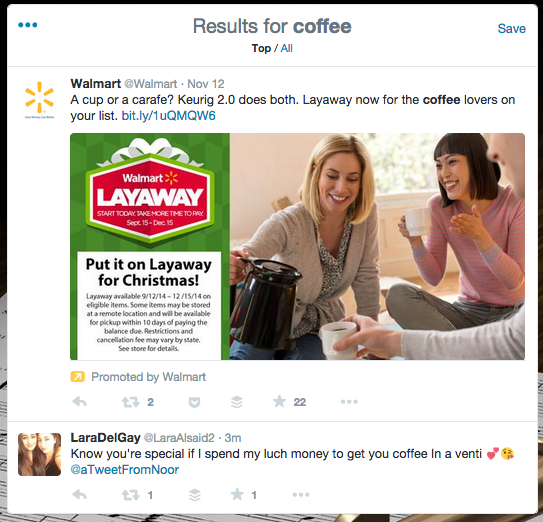 And then my tweet would show up at the top of the results page when people in Syracuse search for a term like “Black Friday” or “Coffee” as you can see Walmart has done here. Now these are just the basics, designed to get you out of your comfort zone and thinking about using paid media more strategically. There are definitely more advanced tactics like custom audiences, retargeting and automated amplification, where you determine a benchmark of engagement or impressions and boost when a certain post hits that threshold, but that’s another article for another day. As with any new social media tactic (and paid media investment) you’ll want to calculate the time it takes for you to produce and run the ads when compared to the results you get from it. The real lesson here is that sometimes these little touches and elements of thinking “outside the box” as some might say, make all the difference when it comes to winning in social, especially throughout the holiday season.